Research on patent valuation has become increasingly important in academic and policy circles in the last few decades. In part, this is the outcome of the wide consensus that innovation is a crucial ingredient for growth at various levels. On the other hand, there has also been an overcoming of growth models unilaterally focused on technological-oriented approaches. This book presents novel and original research on patent value determinants, which are intrinsic or extrinsic to the innovator's business model. 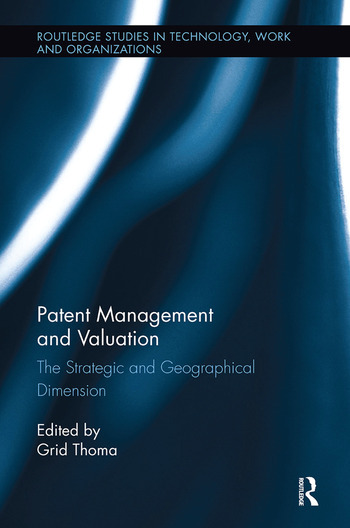 Grid Thoma has undertaken a long study on the strategic factors affecting patent valuation, bringing extensive quantitative evidences across various geographical and institutional contexts. Beforehand, the valuation of the patent real options is appraised when the innovator can postpone the additional investment required for the patent's successful exploitation. Then, he analyses what other complemental IP strategies are combined with patenting that in turn directly affect the value of patents. Moreover, the book scrutinizes the so-called 'strategic patenting' hypothesis according to which innovators obtain patents for other reasons beyond gaining IP protection. A second order of strategic factors affecting the value of patents resides at the outset of the invention process. These are constituted by knowledge spillovers, which are typically mediated by the local geographical context where the invention process takes place. The analysis shows that the contribution of knowledge spillovers from business and nonbusiness organizations to the value of the patented R&D constitutes a relevant aspect for an innovator's decision making. This thoughtful, cutting-edge research book is vital reading for researchers, academics, and policy decision makers in the area of in market valuation, management of technology, innovation management, and economic geography. Grid Thoma is Assistant Professor with Tenure of Economics and Management at University of Camerino, Italy.